In WordPress, navigate to Plugins > Add New. Search for “Newsletter by Supsystic” and click Install Now. When the installation has been completed click “Activate Plugin”. 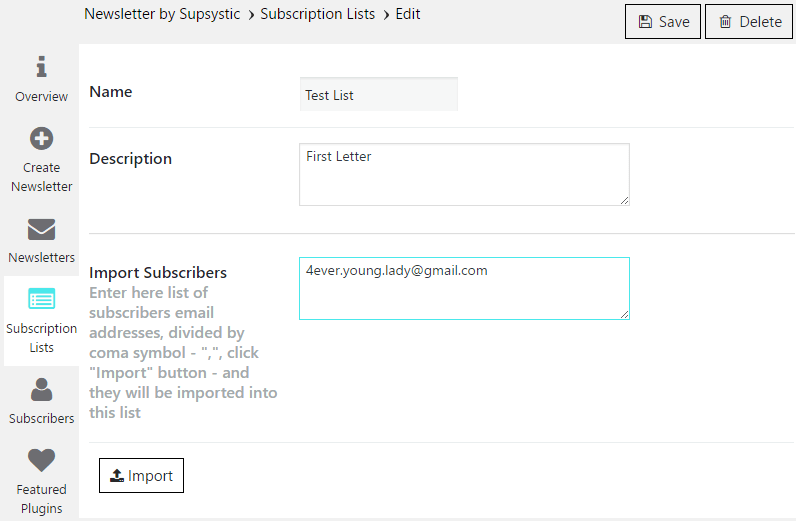 You will have a new admin menu item titled “Newsletter by Supsystic”. In order to make a Newsletter, first of all the Subscribers list has to be done. To begin, click “Subscription Lists” on the left navigation menu of the Plugin. To create it use “+ Add List” button and enter List name. Press “OK” to save. Then, new page will be opened. Here WP newsletter plugin allows you to write notes and description to every Subscribers List. Also it’s possible to add subscribers? emails to the List. Email addresses have to be divided by comma symbol – “,”. Clicking “Import” button you transmit emails into this list. Don’t forget to “Save” your list. In the future, you will be able to customize the Subscription Lists in this section. If you want to edit, change or delete new Subscribers to the existed List use “Subscribers” section. To establish New Newsletter open “Create Newsletter”. Here plugin asks you about name of the Newsletter, to whom to send – “Subscribers List” and estimated WordPress Newsletter Template. It’s offered to choose one of 3 templates: View, Ocean and Daisy. Also You can change it later. On the “Main” tab of the Newsletter you can choose the convenient time to send in “When to send” section. Here “Immediately” means sending right after pushing “Start Sending” button. Below, in the “New content arrived”, “Immediately” means sending right after new content updated. “Daily” – will be send every day at marked time. “Weekly” – will be send every week at marked day and time. “Monthly” – will be send every marked time and day of the month. In the Analytics section, such useful options like “Enable open email tracking” and “Enable click tracking” helps you to know more details about your sent Newsletter and analyze responded results. “Send From Name” and “Send From Email” – Name and Email that your client will see where Newsletter comes. “Reply To Name” and “Reply To Email” – Name and Email that Your client will answer to. “Return Path Email” – Email address where delivery error messages will be sent by mailing systems (eg mailbox full, invalid address, ….). “Send Test Email” – Send test email – to check that everything is working correctly. 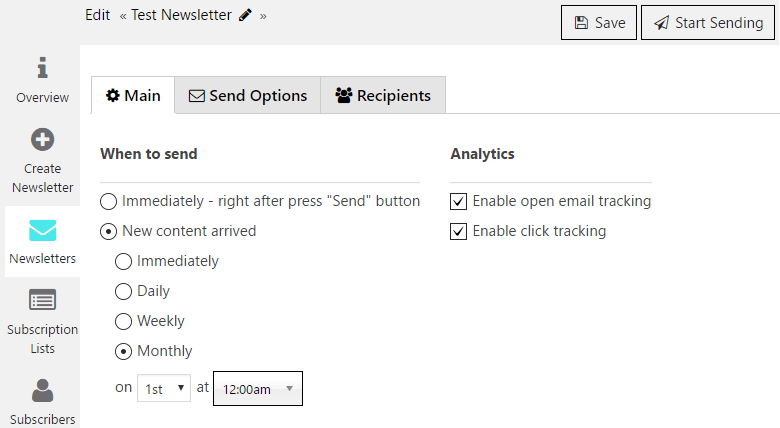 Button “Send” allows you to check how your Newsletter parameters are working right now. Don’t forget to “Save” options. The “Recipients” section allows to you control the Subscribers list. Here you can change the List and see the number of Subscribers in the chosen List. Notice: By changing Subscribers Lists in field above – recipients count will be changed too. To make your own template move to the next step. To create the letter that will be sent to the Subscribers use “Edit Template” on the right side of the Plugin menu. 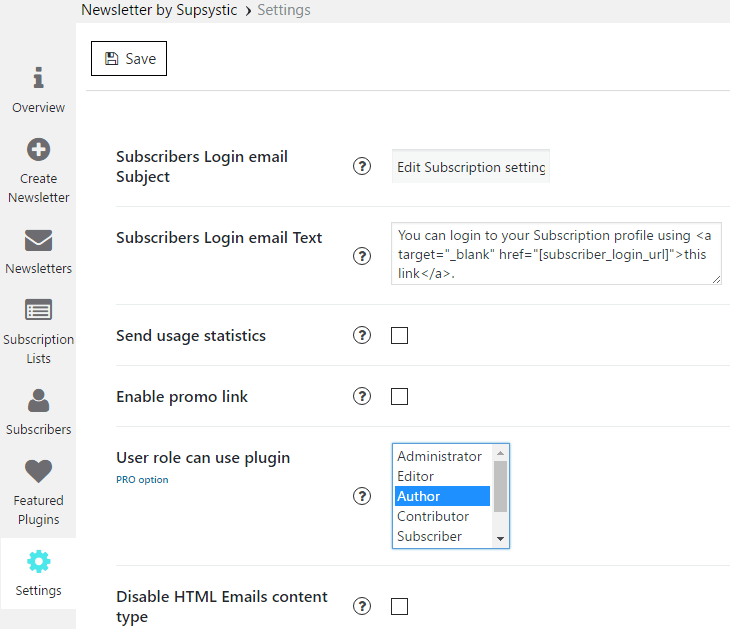 Here you can see a responsive constructing area of the Newsletter Subscribe plugin for WordPress. 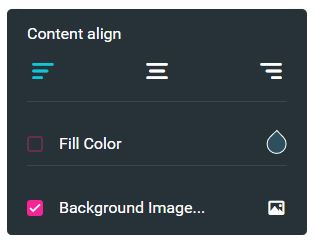 Main menu bar helps you to adjust Background Photo and Color of your page, template width, text style, image position and even “Back to WordPress” settings. On the left tab you can see template divisions for every flavor: footer, static content and dynamic content. The last is made to illustrate changed posts on your site. On the right side you can see three circles to delete, move or change the division look parameters. The last helps you to: put text on the right, on the left or in center, fill in with Color, choose Background color of regional division. Move button helps you to transport the division to the best place. Trash wipes out wasted one. Also Dynamic Content Settings are available for Dynamic content. They are useful to control posts, links, images, “Read more” button and many others. For details click here. 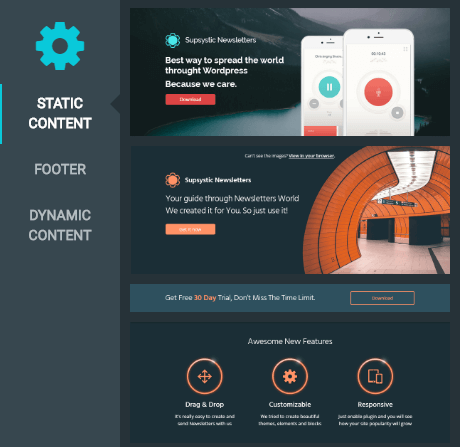 To know more about Template Builder press here. When you want to see the final result, click “Preview” on the top right or “Save” the template. 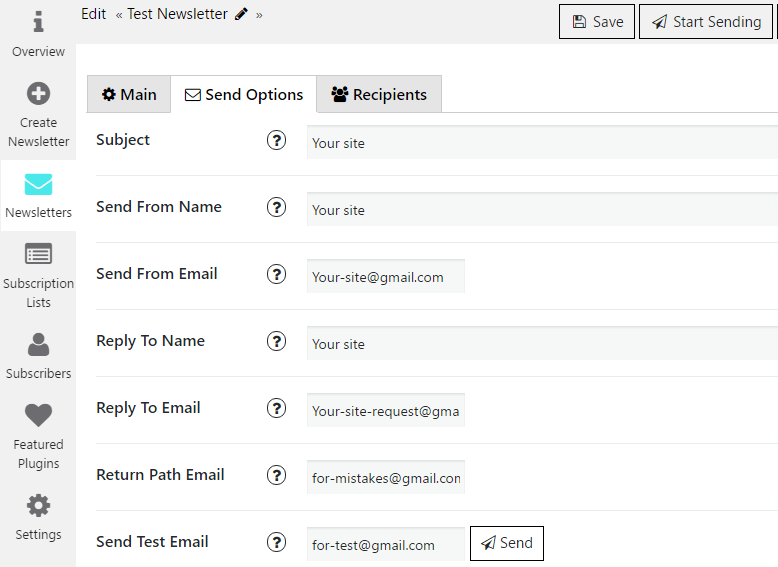 To adjust Newsletter installations choose Settings on the left navigation menu of the Plugin. Subscribers Login email Subject – If you mark here, this setting will send email message Subject to subscribers when they will try to login using our login form. Subscribers Login email Text. Email message text that will be sent to subscribers when they will try to login using our login form. Disable HTML Emails content type. Some servers fail send emails with HTML content type: content-type = “text / html”. So here you can disable this feature, if you have problems with sending emails from our plugin. Emails per Queue. The best WordPress Newsletter Plugin by Supsystic is sending emails by batches – this is made because of big amount of emails can just stop woking your server. The basic number which is set in our plugin automatically is 80 emails per a hour. Plugin Newsletter settings allow to change it on Settings tab, but it’s a rate which was recommended by Google developers in order not to be recognized as spammer. An important point connected with emails number is also the frequency of their sending. Thus Emails Queue check Frequency allows you to choose it. Supsystic recommends you to set it once an hour (as it is set basically). But remind, that if you choose this option and start your newslettering queue it will start in an hour. So do not expect an immediate result, please. If you want just to test our Newsletter plugin, because you are using it first – choose another option, like every minute, every 10 minutes etc. Don’t forget to “Save” settings. When everything is ready, press “Start Sending”. Sending will be performed according to the settings made by you earlier. Also you can check more additional information in the Subscription articles.